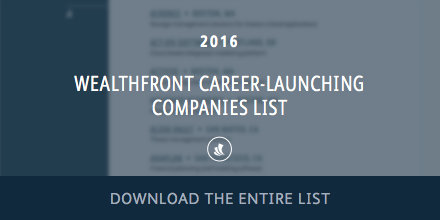 Editor’s note: Check out our 2019 Career-Launching Companies List. Today we are pleased to present our fourth annual list of US mid-sized technology companies with momentum. We publish this list because we believe these companies are the ideal places for young people to start their careers. 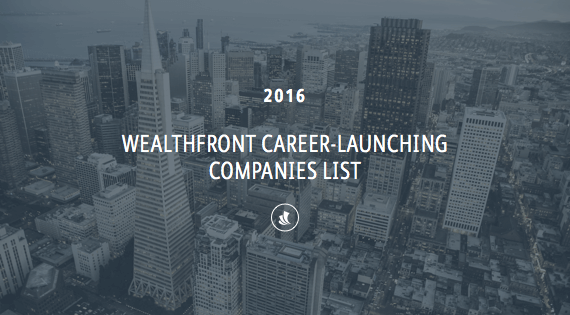 Most Wealthfront clients are in their 20s and 30s, and their financial success will primarily come from success in their professional careers. Nothing early in your career is more important than achieving success — and nothing signals success more than working for a successful company (for a complete explanation of this logic please see the post that accompanied our original list: 48 Hot Tech Companies To Build A Career). To qualify for our list a company must currently have revenues between $20 million and $300 million and be on a trajectory to grow at a rate in excess of 50% over at least the next four years. We built our list by surveying the partners of the following 16 venture capital firms: Accel Partners, Andreessen Horowitz, Benchmark, DAG Ventures, Dragoneer, Greylock Partners, Index Ventures, Lightspeed, Kleiner Perkins Caufield & Byers, Matrix Partners, Redpoint Ventures, Ribbit Capital, Sequoia Capital, the Social + Capital Partnership, Spark Capital and TCV. Download the full list here. I am especially struck by the dearth of IPOs, the number of new additions and the number of private companies that have grown too big for our list. For all those people who think there’s a bubble going on, I invite you to tell me another time in history when so many compelling technology companies have been created. We had a ton of interesting businesses in the late 1990s, but few had the revenue momentum of the companies listed today. Back then, we never would have seen 11 rapidly growing private companies with revenues in excess of $300 million. I’m actually a little worried that some of these companies are waiting too long to go public. By the time some of them are ready, their growth rates will have declined. As we explained in Winning VC Strategies To Help You Sell Tech IPO Stock, the public markets are not kind to companies that have declining growth rates. As usual the majority (57%) of the companies are based in the San Francisco Bay Area. The majority of the Bay Area companies (60%) are still located in San Francisco rather than Silicon Valley, although surprisingly the percentage is down from a peak of 70% last year. New York and Boston are distant competitors to the Bay Area when it comes to hosting companies that are likely to become very large, although both New York and Boston slightly gained share. Utah was the notable rising star, growing from 1 to 5 companies. Enterprise companies held steady at 60% of the companies, up slightly from 59% the year before. 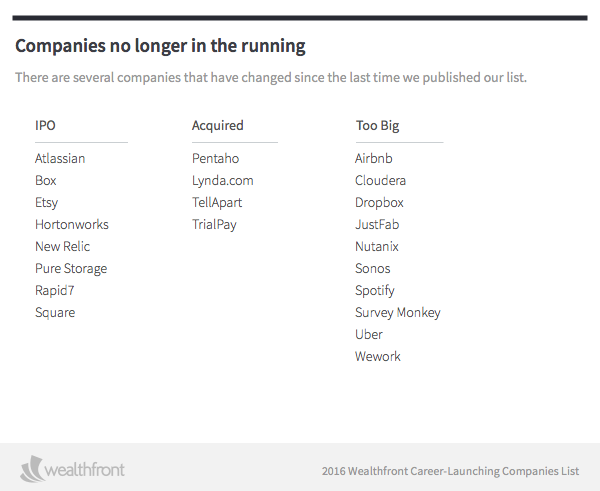 Interestingly 56% of the companies that went public or grew too big for our list were enterprise focused companies. This data is in contrast with the popularly held view that consumer companies have the opportunity to build much greater ultimate value. Once again only five of the Bay Area consumer-focused companies are not headquartered in San Francisco. People who want to work on the Peninsula may need to look for slightly earlier stage companies. Interestingly only three hardware companies are left on the list and only one is based in the bay area. This is amazing when you consider that semiconductor and hardware companies created Silicon Valley. Many people ask us why a financial advisor would publish a list like this. Our answer is your career decisions will likely have a much bigger impact on your ultimate net worth than your investment decisions. We hope you find the 2016 list helpful. While it is always possible that we may have missed a few companies, we believe this list is an excellent start for professionals looking for differentiated success in their careers.